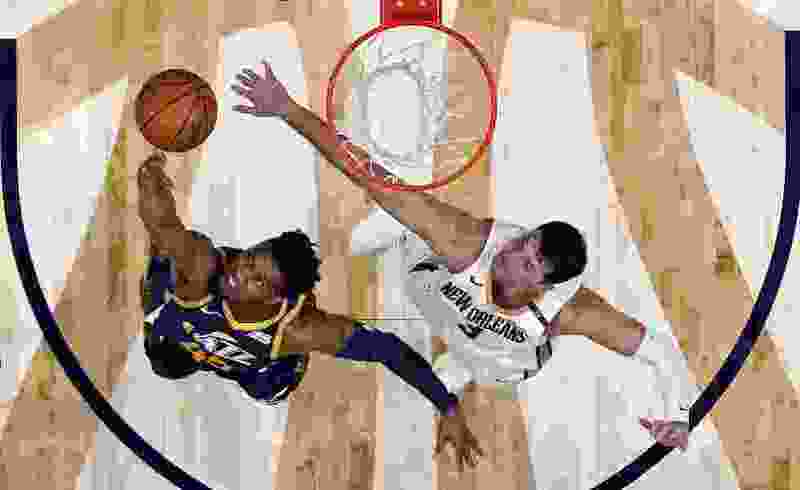 The Jazz knocked the Anthony Davis-less Pelicans from the ranks of the NBA’s unbeaten Saturday evening at the Smoothie King Center, dominating the middle quarters and surviving the fourth en route to a 132-111 victory. Ricky Rubio shook off his rough start to the season, springing to life with a 28-point, 11-assist effort, and Rudy Gobert feasted inside on smaller defenders, finishing with 25 points and 14 rebounds. The Spanish point guard, who came in having shot 0 of 4, 5 for 12, and 1 for 8 twice (21.9 percent overall), made 8 of 14 on Saturday, and said the difference was as simple as finally not trying to impose his will on the game. After missing his first two shots, the point guard got hot, repeatedly getting by defenders at the 3-point line and driving into the paint for uncontested lay-ins. He also had it working from outside, going 3 of 7 from deep. He finished the first quarter with a team-high nine points, and the first half with a team-high 20. Meanwhile, with Davis sidelined by a sprained right elbow, Gobert made his presence felt inside, catching lobs, ramming home putbacks, and generally obliterating anyone from the overmatched cabal of Niko Mirotic, Julius Randle and Jahlil Okafor who tried to slow him. The Frenchman shot 11 of 13 from the field, and said he cared zero percent that it happened with Davis sidelined. Donovan Mitchell, one game removed from scoring a season-high 38, was more than content to play the playmaker role early, which coach Quin Snyder had praised him for in Houston. The second-year repeatedly drove the lane, attracted the defense, then dumped it off inside for a Gobert dunk, or fired it out to the corner for one of the team’s 10 3-pointers made. All six of his assists came in the first half. He later picked up his scoring effort to finish with 22 points, but praised his backcourt-mate with being the difference-maker. With Davis out, you knew the Pelicans would turn their offense over to Mirotic and Jrue Holiday. The big man from Montenegro certainly did his part early. Firing it up almost as soon as he touched it, he hit 6 of 7 shots — including all three of his 3-pointers — for 15 points, as New Orleans raced out to a 31-28 advantage. With Mirotic fairly quiet thereafter, though (he finished with 25), the Jazz took advantage. They doubled up New Orleans 36-18 in the second quarter, then poured in 38 more in the third. It was looking like Snyder would be able to sit his starters out of the fourth and let the bench close it out. Except the Pelicans decided not to play along. Led by a lineup that included Holiday and four bench players, including former Lone Peak High product Frank Jackson (who finished with a season-high 14 points), New Orleans whittled a deficit that had been as much as 28 points down to single digits at 110-102. But finally, the moribund and stagnant Jazz snapped back to life. A Jae Crowder lay-in here. A Rubio drive there. A steady parade to the foul line. And finally, when Gobert caught an alley-oop one-handed, jammed it down, and converted the and-one, the lead was back up to 21 with just over 3 minutes to play, and the crowd made a beeline for the exits. “Yeah, we did,” Rubio agreed with a smile.